It’s taken me a while to process and think about what I took away from HRevolution. Other than “The HR Apprentice” session where I was a team captain (thanks Steve Boese) and talked up out of necessity, I primarily sat quietly absorbing content and was the most active-listener I have been in a long time. I continue to think about (and even dream about – yikes!) conversations and comments and moments. I had a conversation with my CEO on Monday and told her that it was the best event I ever attended (and my first unConference) but also that I was feeling a bit sad. Sad? Yes…because I fear for the ability of our HR family, and by extension our organizations and communities, to evolve. It’s like the aftermath of hanging out with Uncle Andre at a big family dinner. So I took a few days to reflect upon my sadness – how could I leave HRevolution so incredibly energized (and I was/am/will continue to be) yet also feeling so lost and alone and bereft? What left me feeling sad after HRevolution was the realization that when I go to the next HR family dinner back home, I won\’t have Uncle Andre by my side. Rather, I\’ll have the other family members around the table, the ones I see every day… the ones who can\’t or won\’t evolve. Is their unwillingness to evolve a conscious choice or a matter of their inherited traits? Are they fighting evolution – and do they even know they NEED to evolve? Cousin Ashley is an HR Director who has been employed for a long-time with the same company – she\’s quite accustomed to and very comfortable with the status quo, and sees no need to adapt to the changing world beyond her immediate border. Aunt Marie is content performing super-effective HR administrative work (and someone has to, let\’s face it), and while she has a day-to-day impact within her company, she doesn\’t necessarily care about moving the profession, or her organization, forward. And Brother Joseph continues to eat dinner with the same family members, in the same geographic location, and sees no need to worry about trying another cuisine or having any other dinner conversation than the ones he has always had at the dinner table – with the people who think JUST.LIKE.HIM. To talk about evolution means discussing adaptations and mutations and natural selection. Perhaps Uncle Andre and I have adapted or started to adapt; perhaps we are just mutants. 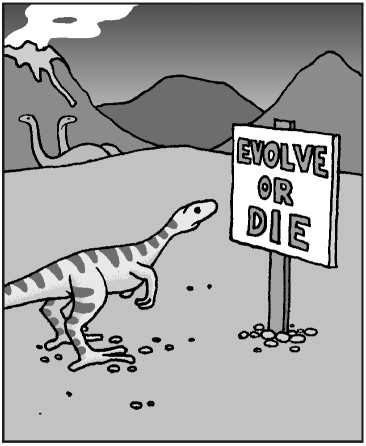 But evolution, for the sustainability of our profession, will NEED to occur. The mutations that Uncle Andre and I sense within ourselves (like X-Men!) will need to become, and remain, more common in successive generations of our HR family… or HR will cease to exist. And if HR ceases to exist…. then I will really be sad. This entry was posted in General and tagged Guest Post, HRevolution, Robin Schooling on May 13, 2010 by Ben. What a great post – thank you Robin (and Ben). I too am still processing my take-aways from HRevolution – and also came back and told my manager this was the best conference (unconference) I have ever attended. Thank you for taking time to write and share. Already looking forward to the next HRevolution! 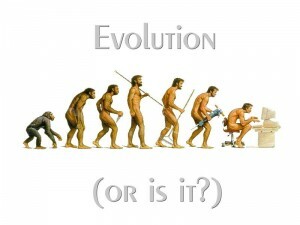 Superb post Robin, I am convinced the HR can evolve and your point about natural selection was brilliant and right on. I am in the very same space as you and feel the pull between knowing what is possible and looking around the profession and seeing blah. I am so fortunate to have a great HR staff and when I look to fill positions, good old Cousin Ashley, Aunt Marie and Brother Joseph do not make my cut. In my own way, I am making (naturally) making my selections. More of us doing that with HR will make a difference – one action at a time. On another point, the more CEOs, managers and leaders know what they can/should be expecting from HR, the more “incentive” HR pros will have for stepping up their game -or being selected out. SUCH a good post, Robin. It perfectly captured the problems of why busting the silo or breaking out of the echo chamber or whatever buzzword you want to use is SO. DAMN. HARD. Fantastic post, Robin. Even if I am jealous that you did not choose me to host! I think you have done a wonderful job of describing the sense of frustration that many have felt. I love the idea that Lisa mentions of the HR hiring process as a kind of natural selection. Thanks for being a good sport and leading the HR Apprentice team, I hope you are enjoying the rare HRevolution coffee mug! I’m so grateful you wrote this post Robin. Not only are you one of my favorite people on twitter, you are one of my favorite people in our Industry. You are bright, articulate, and wise. Your insight is so enlightening, and I appreciate your presence in my professional life. Thanks everyone for reading. And thanks to Ben for allowing me the opportunity to post something. I may still be an upstart after all. Thank you for an interesting post, it is interesting to see that “HR” has and is seen in a similar way around the world. Here in Australia, the same things apply. I agree with Lisa, making natural selections will help change HR, I have mentored HR people to evolve, and they are now spanning out. There is still a long way to go, only this week, a very large company that is national and international, their HR person, chose to go a mediocre path because they were afraid that bringing in someone who had wider experience than themselves would overshadow them – a great opportunity lost for HR and the organisation. I think this might be my favorite post this week. I applaud the Uncle Andres of the world. I was blessed enough to meet you and several others from the same mind set of not doing things the way they have been done before. Frankly it won’t work to keep doing things the same way. I applaud your desire to stretch the ‘HR family tree’ a bit more into the sunshine so that it can grow! I really appreciate everyone encouraging Robin (after she encouraged all of us with her superb post!). I hope she picks up her blogging hat more often and graces some of the rest of you with some of her wisdom and experience. I’m hoping to get into HR because I have tried to tell people(management and works)that you have to evolve or grow to keep up with technology and improvements. HR needs to lead by example, not just sit on the phone in an A/Ced office and talk about Safety, 5s , 6 sigma or GMP. HR must evolve if a company is to evolve.